Shirley's parents visit, and they try to find a hidden meaning from every sound and sentence when these are simple every day things. 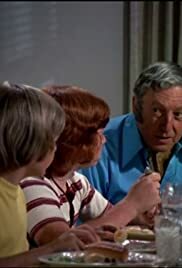 Soon, the Partridge family is finding faults with everything and arguing with each other. "The Modfather" was the first of three scripts from Susan Harris, future creator of SOAP, BENSON, THE GOLDEN GIRLS, and EMPTY NEST (followed by "Whatever Happened to Keith Partridge?" and "Aspirin at 7, Dinner at 8"). Ray Bolger appears for the third and final time as Grandpa Renfrew (now renamed Walter rather than Fred), while Rosemary De Camp would return as Grandma Amanda in "Maid in San Pueblo," opposite Jackie Coogan in place of Bolger. For once, Shirley's parents aren't fighting, having spent a week with an encounter group, who want to share their new outlook with the rest of the family. By insisting on total honesty, they wind up putting the kids into an argumentative mood, which doesn't please mother Shirley one bit. Walter and Amanda finally decide to split up, and continue to live together in sin, trying to top one another in dating other people. While Walter entertains two young girls fascinated by The Great Depression ("it's so depressing! "), Amanda sits and listens to a businessman too busy boasting about his acumen to allow her to get a word in edgewise. Susan Dey tries out her Southern accent (later seen to hilarious advantage in "Keith and Lauriebelle"), while one of the young lovelies is played by Ondine Vaughn (later seen in "Bedknobs and Drumsticks"), one of the actresses previously featured on THE MONKEES ("Card Carrying Red Shoes"). The featured song is quite appropriate, "Something New Got Old," composed by Wes Farrell and Bobby Hart, from fifth LP SHOPPING BAG.